As we discuss in our article on the Science of Symbolism, there is no ancient myth, fable, or folk-tale which does not contain some historical fact, moral principle or occult truth concealed under the cloak of allegory and symbolism. This is true of many (but not all) so-called 'Fairy-tales' too. The story that follows has been sent to us by Erika Hahn who was inspired to retell Hans Christian Andersen's tale of 'The Philosopher's Stone' in her own, unique way. Her story contains a number of occult truths in a concealed manner not found in Andersen's story. You can read more about the hidden wisdom in fairy-tales in our accompanying commentary in the sidebar. IN THE LONG, LONG AGO, in a faraway kingdom, beyond the farthest seas, there stood a Golden Tree. It was bigger than any forest in our world and so high that the stars lived in its topmost branches; and every branch and twig was another tree—so that it seemed to be the very father and mother of all trees, so vast was it. Brightly feathered birds alighted upon its flourishing boughs and the most beautiful flowers and wonderful fruits grew amidst its rustling leaves. Within the heart of this tree there was a secret garden surrounding a most magnificent palace. And from its twelve jewelled windows you could see all the countries of the Earth. Gems of all the colours of the rainbow adorned the soaring walls and gold-capped towers, and everywhere bloomed everlasting flowers, encircling shimmering, reeded lakes and marble terraces, and stately groves of oak, and sycomore and cedar. In the palace dwelt a most remarkable King and Queen. Their faces shone brighter than the Sun at noonday and their eyes were filled with love and wisdom. They were so glorious that ordinary people like you and I would die of joy if we saw them. There they lived in the midst of that shining garden, surrounded by their magnificent court, ruling the Kingdom of the Tree so well that no one was ever hungry, or sad or alone; and they smiled upon their beautiful seven children who grew up strong and kind and happy, as only the children of wise parents can do. Like all children, they liked to be told stories and their mother, the Queen, told them many strange tales of faraway lands and peoples which ordinary children might not understand. The King, their father, taught them from the jewelled pages of the Book of Truth, and showed them the strange doings of the people in all the countries of the Earth that could be seen through the twelve magic windows of the palace. They saw great cities rise and fall and rushing oceans overwhelm the green valleys and forested hills of once flourishing lands, only to recede again before the uprushing of snow-capped peaks. Deserts came and went before their startled gaze and proud Lords and Ladies were changed to ragged beggars and poor urchins into Princes—all in the twinkling of an eye. And in many countries fear and want stalked the land and the heads of the people were bowed down with care and weariness, whilst their proud rulers dwelt in ease and plenty. One day the youngest of the King's seven children was sad seeing the hard lives the people of those faraway lands endured and he asked his father why they were so unhappy. Then his father, the King, sighed, and told him that deep within the hearts of these people there was concealed a tiny, magic pearl no larger than a grain of sand. "These jewels," he added, "Are given to all, that by their light they might see what is good and learn to avoid the bad. For all sadness and evil there is counsel and remedy to be found, but the pearls desire that the people should search it out themselves, in order that they may become strong and happy and wise. If they will not do that, then the pearls grow dim and lose their lustre, so that the people may experience the results of wise or foolish conduct. "The people that you saw have so long followed the example of their wicked rulers, who wallow like swine in the mire of their evil passions, that the light of their pearls has all but been extinguished, so that many have quite forgotten they even possess one. Whilst the very few that do remember are laughed at by all the rest, so that its very existence is doubted by all but the very youngest and oldest of them." "Why do the people not overthrow their wicked rulers," asked the prince, "and so revive the power of the pearls for good?" "Because," said the King, "There is a most fierce serpent in that land which lives within a secret cavern, deep within the turbid dark waters of a noisome lake. There he weaves his wicked web of lies whose sinister threads reach into every corner of that country and hold almost all the people in its necromantic spell." Then the King's son bravely declared that he would travel to that faraway land and restore the remembrance of the magic pearls and vanquish the evil worm. "Much will change when I go into that country," he said. "For I shall bring the flowers and fruits of your Kingdom to the people, and they will respect your son and I shall utterly destroy that evil serpent!" Now these were brave words and true that the young prince spoke, and all the court applauded him. But his father and mother were silent, knowing in their wise hearts how easy it is to speak brave words when we are safe and happy in our true home and have not endured the great storms that raged beyond the strong walls of the palace. Nor suffered cold and pain and sorrow; and the great aching loneliness which was the lot of the poor people in that distant land. But the proud prince was determined to go, even though the icy hand of fear gripped his heart as he beheld the concern in his parent's eyes. Then the King took off the prince's royal garment which was set with gems and spangled with gold which he had made for him because he loved him. And he promised him that if he succeeded in his Quest it should be restored to him and he would become one with his elder brothers and sisters as an heir to his father's Kingdom. So the young prince took leave of his parents and bade farewell to the court with tears in his eyes and equipped with the treasures of The Kingdom of the Tree, he set out on his perilous Quest. After many strange adventures and overcoming many dangers, he came at last to the country he had seen from the magic windows of his father's palace. And because he was a stranger among them, he put on the garment of skins which they wore, so they would not recognise his royalty and awake the wicked serpent against him. "What do we know or care for such imaginary and worthless baubles who have all that we desire from the wise and generous serpent that has made us rich and powerful and FEARED, so that all the people tremble before us!" Yet in their black hearts they were secretly afraid of the prince and sought to lay cruel hands upon him but he always managed to escape the traps they set for him through the aid of his father and mother who watched over him from afar. One day, when he was very weary and utterly at a loss to know what to do or how to complete his Quest, he wandered into a dark forest. There he met a bent and grey-haired old woodcutter who befriended him and gave him shelter in his little hut amidst the trees. You see, this was no ordinary woodcutter, though he was good and kind, but a messenger from the prince's own home, sent to help him in his Quest. And he told the prince that many days journey to the west there lay a little village where he would be welcomed and find those who would listen to his message and accept the gifts he had brought with him. The prince thanked the old man and following his directions, left the forest behind and entered a kindlier country where the shadow of the wicked serpent was lighter than the gloomy cities it shrouded with a leaden chill. When he reached the village and the little children saw all the beautiful things he had brought they ran to him with glad cries, and tears shone in the eyes of the old men who welcomed him with great rejoicing, for they had not entirely forgotten the magic pearls within their breasts, nor did the evil spells of the serpent entirely blind them. "Nay! We are all the subjects of my Father the King and my Mother the Queen and of the Royal court which reigns on their behalf; praise them, not me, who am but the youngest of my Father's children." Long did the prince remain in that village and every day more and more people came from far away to hear his message and to eat the magic apples which never diminished, no matter how many were eaten, so that were always enough and to spare for all who asked for them. And in time he discovered where the evil worm had his secret lair and many stalwart villagers with new hope and courage in their hearts offered to show him the way and lend such aid as they could to his Quest, though they were sore afraid of that cruel and merciless serpent. But unknown to the prince the spies of the rulers of that land, guided by the serpent's cunning and the fame of his coming, had found their way to the village and made report to their dark masters. Soon they knew he was a stranger in their land and they conspired together to trap and enslave him. For they greatly feared his growing power over the hearts and minds of the people and trembled within, where dwelt THEIR pearls; black as night and without the slightest glimmer of light to illumine their cruel hearts. With fair speeches and feigned friendship did the smooth-tongued rulers lure the trusting prince to a great feast in his honour in the ebon-walled capital city of that country. There they beguiled him with false flattery, rich meats and costly gifts; and did mingle narcotic herbs in his wine so that he completely forgot his Father and Mother and became a servant unto their king, who was in thrall to the serpent, wicked and cruel and ruling all that troubled land with the sceptre of fear and the rod of violence. And the prince remembered no more his Quest, and fell into a deep and troubled sleep. In his noisome lair, the wicked serpent laughed in triumph and returned with renewed zeal to his labyrinthine plots and endless devilries, secure in the deep darkness none had ever penetrated. "My son has fallen into deep waters and will surely perish from the poisonous draught those wicked people have mingled in his wine!" "Alas! Alas for the prince that is lost to us! Who shall save him now?" cried his sisters in anguish. Then the Great King fell down upon his dazzling face and all the great nobles cast their crowns upon the ground crying with one voice: "Alas for the prince! For whoever leaves this Kingdom to rescue him is doomed to fall into the same sleep and forgetfulness, yea even unto the Lord our King!" But then the firstborn son of the King, who had neither wept nor spoken, arose from his golden throne and lifting up his father with a gentle hand, said: "Weep no more! O weep no more ye Lords and Ladies, for does not the very Pearl of Pearls dwell within my breast who am the Heir of my Father's Kingdom? Who shall prevail against it?" Before anyone could prevent him, he plunged a jewelled dagger into his breast and plucked forth a dazzling star from his heart. No sooner had he done so than the pearl was instantly transformed into a mighty Hawk who stood over the lifeless body of the prince with blazing eyes and golden-feathered wings outstretched. All the court was hushed in fell amaze, as turning to the King, the Hawk addressed them all in sonorous, commanding tones: "Neither sleep nor forgetfulness shall overcome me; nor shall the serpent prevail against me. Only command what I shall speak unto the prince, our Royal Brother, and it shall be done!" Then the Royal Hawk took the letter in his beak, saying: "The Prince, thy firstborn is not dead. He sleeps, even as his younger brother sleeps and when that Royal Pearl that has clothed itself in Me shall return unto his breast, both shall awaken again." So saying, the Hawk flew swiftly to where the young prince dwelt in the city of the serpent-king. No sooner had it alighted upon him than he started out of sleep and remembered his Quest and with it the glory that he shared with his Royal brothers and sisters in his Father's Kingdom of the Tree. "Come, arise and haste away", said the Hawk, and having cast the king and all the people of the city into a deep sleep, he conducted the prince his brother to the iron-barred gates which opened soundlessly at his command. After journeying for many days the twain reached the shore of the turbid, dark lake, where dwelt the evil worm in his secret lair. "Now begins your Quest in earnest," said the Hawk. "And though I may not aid you in your trial know that the love of your Father and Mother is ever with you. Nor shall it fail you as long as you remain faithful and true." With that the Golden Hawk spread wide his mighty wings, and wheeled away following the path of the Sun, to await the coming of his brother. The serpent shivered in his cave for he knew in his heart, where lambent black flames had long since transformed his pearl to darkest pitch, that his hour was come. Yet still he raged against his fate and sent forth his creatures to destroy the prince. But they availed him not and the prince slew them every one until their foul blood turned the dark waters of the lake to deep crimson. Then at last, with hate-filled suddenness, the serpent thrust his loathsome body from the lake and drove his cavernous jaws straight at the solitary figure upon the shore. Clad in the steely armour of grim determination the prince stood his ground and fixed his Royal gaze upon the flaming red eyes of the monster as it rushed toward him. With his hands he forced open the mighty maws and watched the fire die in the serpent's malevolent orbs as it fell, defeated, beneath him. Thus did he utterly vanquish that evil worm, which sank below the swirling dark waters, never more to trouble that land. At once the magic pearls within the people began to shine with renewed lustre, and in time all that land was healed and made clean again. And to the faithful villagers who had sheltered him and listened to his message, the prince gave a magnificent jewel of his Father's. The people cast down their cruel king and with him the wicked rulers who had enslaved them for so long. And they set up a new king, noble and kind, chosen from among the good people of that village, and in times to come their country flourished, and many fine trees grew there which resembled the wonderful Tree which was the prince's home. At last the time came when the prince bid farewell to the people, who wept openly at his departure, and putting off their garment of skins, he returned swiftly to his Father's court that stood in the magic garden within the spreading heart of the mightiest of Trees. There he was arrayed in the royal garment set with gems and spangled with gold and his Father placed a crown of crystal upon his head, shining with many rays. Then the prince embraced his Mother, the Queen and all the court shouted for joy while his dear elder brother, restored to life once more as he had foretold, rained blessings upon him who had vanquished the wicked serpent, and restored the Pearls of Great Price, whose other name is WISDOM. NOTE: If you have enjoyed this story you may also like The Adept and the Imp—a tall tale of temptation, devilry and magic in which you can find a number of occult teachings concealed in a seemingly daft manner. 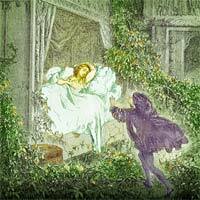 You may also find our article What are Fairies and Nature Spirits? of interest, which presents the true facts about this subject without misleading embellishments or fanciful speculations. Story © Erika Hahn. Commentary © Copyright occult-mysteries.org. All worldwide rights reserved. Published 1 December 2014. Updated 5 July 2017. Fairy-tales are generally regarded as fit only for children, having no connection with the 'real' world adults inhabit and think they know so well! But this is a comparatively recent attitude, which was not shared by Hans Christian Andersen, who when he learnt that a statue planned to commemorate him would have children clustering around him, wrote: "my blood boiled and I spoke my mind in no uncertain terms." His aim, he added, "was to be a poet for all ages," and so we regard him, and a most gifted one too. Yet it is true that children, when not corrupted by adult cynicism and worldly cleverness, enjoy Fairy-tales. This is because their minds are so much closer to the Heavenly Realms they have so recently left to incarnate on earth, and they still retain the memories of that blissful state. These enigmatical lines make concealed reference to the mysteries of the Sun and Moon, as well as the secrets of reincarnation and evolution. This shows that the inspired poet and visionary, under the afflatus of Divine enthusiasm, is able to reach out to the Higher Realms and receive the very highest truths from the dwellers there. It is interesting to note that a mysterious visitor to Tolkien's home is said to have asked the bemused poet: "you don't really think YOU wrote all those stories, do you?" We do not know the poet's reply but may conjecture that the question gave him much food for thought! You can read more about the esotericism in The Lord of the Rings, as well as the author's mythos, legendarium and involvement with Occultism, in our three-part article about J R R Tolkien and his writings. Fairy-tales are very ancient indeed. Just how ancient we would not conjecture to say. They are found universally, and we incline to the opinion that many of them are the scattered fragments of the Ancient Mystery Teachings, which over the long course of time, have been transformed into fable and myth. There is no country or nation on earth which does not possess its store of such tales, which in their re-telling have attracted such a thick crust of fantasy and embellishment that the occult truths they conceal have become almost invisible to all but the very few. Many of these stories are so old that it is impossible to say when they were first recorded. Such are the stories of princesses being imprisoned or cast into sleep. Here we have a clear allusion to the imprisonment of the Soul (Higher Self) in the body and the forgetfulness of its former Divine state. In Andersen's The Snow Queen we find so many occult truths concealed under the cloak of allegory and symbolism that it would be possible to write a large book about them. As we have neither the time nor inclination to do ALL our readers' work for them, a few examples must suffice. The author divides his story into seven parts: a most significant number as many of you will know. The first part describes the creation of a distorting mirror by the devil which had the strange power of making anything good or beautiful reflected in it appear horrid, whilst all that is evil and worthless seemed attractive. Could one find a better description of the topsy-turvy, wrongside-uppermost nature of this illusory world? Andersen does not name this mirror, but we will and call it the 'astral light'. Like his fictional mirror, the astral light distorts everything reflected in it. Andersen's mirror is shattered into "millions and billions" of pieces, which are scattered all over the world. In the same way does the astral light mirror the thoughts of mankind, with the difference that it reflects both evil and good, so influencing us in either way, or direction. In the second part of the story, two splinters from the mirror enter into the eyes and heart of a little boy, Kai, and from then on he regards the world with the cynicism and worldly cleverness we referred to earlier, and is much admired for it. In just this way does the lower self blind our eyes and harden our heart. Need we enlarge on this? Kai now hitches his little sled to the sled of the Snow Queen. In this we may read an allegory of the man or woman who, forsaking the path to the light, turns to the darkness, be that darkness merely blindness to all higher influences and thoughts, or conscious or unconscious cooperation with evil in any form. The Snow Queen may also be regarded as an emblem of the Moon, that white, cold, dead world, whose influence on mankind is on the whole not a good one, as we may read in The Secret Doctrine in which the nature of our mysterious satellite is discussed in great depth. As if to confirm our interpretation, at the end of this part, Andersen writes: "The Moon came out, and into its large and clear disk Kai stared all through the long winter night. When daytime came he fell asleep at the feet of the Snow Queen." The third, fourth and fifth parts of the story concentrate on Kai's sister, Gerda and her search for her lost brother. The different landscapes through which Gerda travels and the strange folk she encounters have a very otherworldly feel about them, as if we are now in another dimension. And so we are, though Andersen does not tell us as much. Gerda's journey shares many elements with the mystical search of the soul (Higher Self in our terminology) for enlightenment and liberation. This is a familiar theme in both fairy-tales and mythology such as we can find in the legend of Ishtar who descends into the underworld to rescue her lover, Tammuz, which story is at least 3,000 years old. In the sixth part, Gerda learns that Kai is in the Snow Queen's palace and quite satisfied with his lot, thinking it is the best place in the world. This of course, is the effect of the slivers of the distorting mirror which are lodged in his heart and eyes. The allegory could not be any plainer; the Higher Self blinded and bound fast in the web of illusion and ignorance. We find the same theme in Plato's Allegory of the Cave, proving the antiquity of all these recurring themes of loss, imprisonment, seeking and finally liberation. In the final part we are told that the Snow Queen's throne was placed in the middle of a frozen lake which she called the Mirror of Reason, which had "cracked into thousands of pieces", every one of which "was shaped exactly like all the others." This is not such a bad description of cold, hard intellect which can never solve the great mysteries of life and death no matter how many pieces of the puzzle it broods over, for they are shaped exactly like all the others! This confirms the occult truth that all material things, without exception, are derived from one substance, the nature of which the unaided intellect can never know. We now learn that Kai is "...almost black from the cold; but he did not feel it..." This is the condition of every materialist, embedded in the web of ignorance. Poor little Kai, having lost all recollection of his true, Divine nature, was now completely blind and deaf to all the higher sensibilities and emotions. Another of God's lost children, vainly trying to "put the pieces of ice together in such a way that they formed a certain word, but he could not remember exactly what that word was," as Andersen poignantly explains. That word, says Andersen was 'Eternity'. We might call it 'God'—for they are the same and mean the same. Perhaps Andersen had this same thought in his mind when he wrote the story; we cannot say. The name of the highest Deity in ancient Egypt was 'Heh', or 'Hehi', which means eternity and everlastingness. And what is more eternal and everlasting than God? The Snow Queen tells Kai that if he can put the pieces of ice together to spell the word she does not name, then he would be his own master and she would give him the whole world. Can we doubt it? For once we become fully conscious of our inheritance as sons or daughters of God we embrace eternity and all that it encompasses. The 'world', meaning this earth, and the heavens above and below will then be at our feet, for we shall have risen up to the dwelling of the Eternal and be true masters of ourselves and our destiny. Finally Gerda finds Kai, and the warmth of her tears falling on his breast melts the icy splinter within his heart; his eyes open and memory is restored to him. This holy moment comes to all sincere seekers after Truth. It is different for each one of us, but however it manifests, once the scales have truly fallen from our eyes how glorious is the Light they behold! Here we must leave The Snow Queen and end our brief glimpse into the hidden truths in fairy-tales. We hope we have encouraged you to read and study such tales for yourself. Not only will you find such studies enjoyable and uplifting but instructive and profitable too.